Here is a variation of a Simran I came up with for Red Fish that are keying on the small shrimp in the creeks and on the flats. It uses some new material, and is working extremely well this Fall. Fellow HPX owner and forum member, Had and I put six reds in the boat on Saturday with five or six more coming unbuttoned. 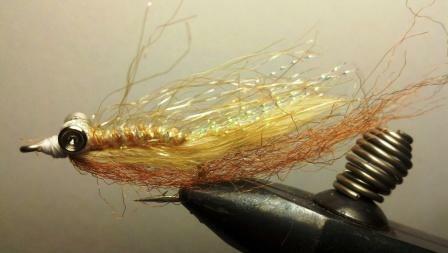 Complete tying instructions are on my charter website, on The Flies page. Enjoy. Are you sight casting to them? Absolutely. We are watching them come finning and tailing down the low tide flat. At low tide last Saturday, the wind stopped blowing, I looked up and saw five different schools of reds high in the water. The big schools of winter are here. There is nothing like standing on the bow and holding the cast until your so close that you can see the eye of the fish focus on the fly before flaring its gills and inhaling the fly! I don't see any tongue, lol! If you're going to do it, do it right! The flats I fish in the fall/winter are primarily mud/sand flats with a few oysters thrown in for good measure. I am going to try the Prawn's Revenge in the summer in the flooded spartina gr*** for tailers. When I do, I will tie in a weed guard. I am sure it will work well. I normally throw a #2 black toad in the flooded gr*** flats. It imitates the fiddler crabs the reds are rooting for in the gr***. The recipe for the black toad is also on my charter website. It works so well, that I rarely tie on anything else when fishing for tailing fish.